Want to take advantage of Wright’s Mobile MedEd Semi when it rolls into your region? Wright’s mobile lab was designed to take training to the surgeon. The large, expandable semi is capable of training up to 25 attendees at one time and can be set-up anywhere there is a hard, flat surface. 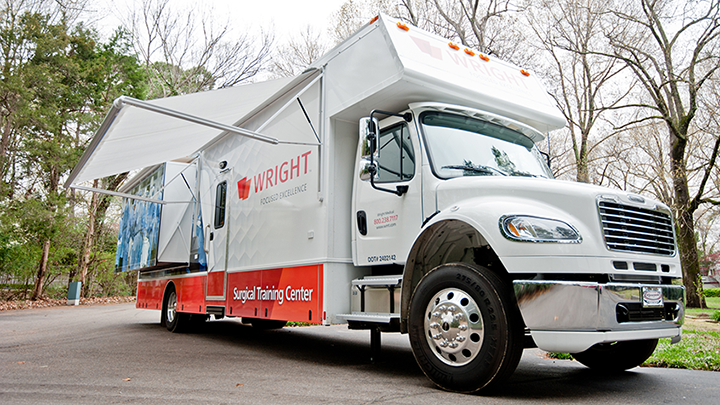 Self-contained with its own power source and all necessary supplies to conduct multiple cadaveric training sessions over several days, the mobile lab is outfitted to train on any/all of Wright’s products. Our Surgeon Education Programs offer opportunities to learn more about our products with participation in hands-on training and individualized attention. Talk to your Wright Medical Sales Representative to learn more about participating in a regional lab with Wright.